The idea of layering all your favorite gold necklaces is a good one until they’re all tangled up even before you go out to start your day. Some of you might have the patience to untangle them, but some might not. And regardless if you don’t mind spending a few more minutes making sure all is set and your look is complete and knot-free, wouldn’t it be nice for your gold necklaces to live in perfect harmony? If you answered yes to that question, we think so too. That’s why we’re sharing with you three tips that are tried and true and that will allow you to master the art of layering gold necklaces (and necklaces in general) with little to no knots. From making sure your collection is truly complete and it varies when it comes to lengths, shapes, and charms to one lazy hack that is simply too good to pass, the tips below will make your mornings or nights easier. Plus, when you’re coveting new necklaces for your collection you’ll already have these tricks in mind, so you only purchase necklaces that will compliment your newly organized collection. However, the best tip we can share even before you read the ones ahead? Take note: Always make sure you have them neatly organized in your drawer or jewelry holder of choice. That way, you won’t have to untangle them even before you put them on. 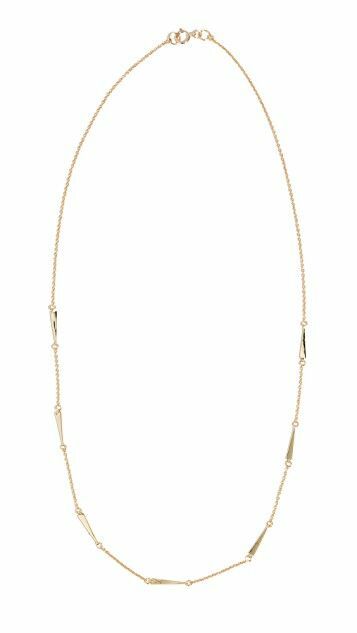 Charms and pendants are nice when it comes to layering necklaces, but sometimes, to avoid unnecessary tangling, keeping it simple with gold chain necklaces is best. Call me by your chain necklace. You'll wear this necklace non-stop. Polished gold always looks so good. Rhinestones but make it low-key. The key to your necklaces not getting all knotted up also lies in knowing the lengths of your necklaces. So, make sure you keep a balance. As long as you have the three most important (choker, mid-length, and a long chain), you'll be able to eye out what else you need to fill in your layered look. Frida would approve of this choker. This hand pendant is a mood. Always wear necklaces that tell you, 'you're pretty'. Long necklaces are a thing now, layer them up. This necklace will match your pearl chocker. But if you want to hack the layering system, simply buy necklaces that are already layered. That way, you avoid more knots than usual and buy two to three necklaces for the price of one. A win-win situation. Throw this one necklace one and you're ready to go. Four chains can go a long way when they're all-in-one. Opt one for charms to keep things interesting. Now keep your jewelry collection growing by adding these trendy necklaces to it.